Karakoram 2018: More Teams Heading to Base Camp in Pakistan. Yesterday we took a quick look a the main peaks that climbers will be focused on summiting this summer in the Karakoram Range in Pakistan. Some of those mountains already have a few alpinists already in place, while other teams are starting to make their way to Base Camp in preparation for the summer climbs ahead. Here’s a quick rundown on some of the things that are currently happening. The Furtenbach Adventures team is trekking to BC on Broad Peak where they’ll warm up before attempting both that mountain and K2. 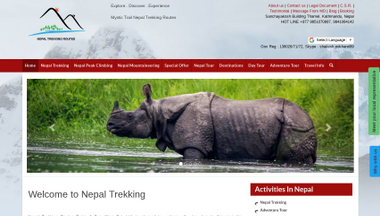 The squad had been on the trail for more than week now and expect to reach Base Camp on Friday where they’ll spend a few days getting settled before starting their first acclimation rotation. At the opposite end of the spectrum, the Madison Mountaineering team is just now preparing to leave for Pakistan, so they’ll be about two weeks behind Furtenbach in terms of reaching BC. 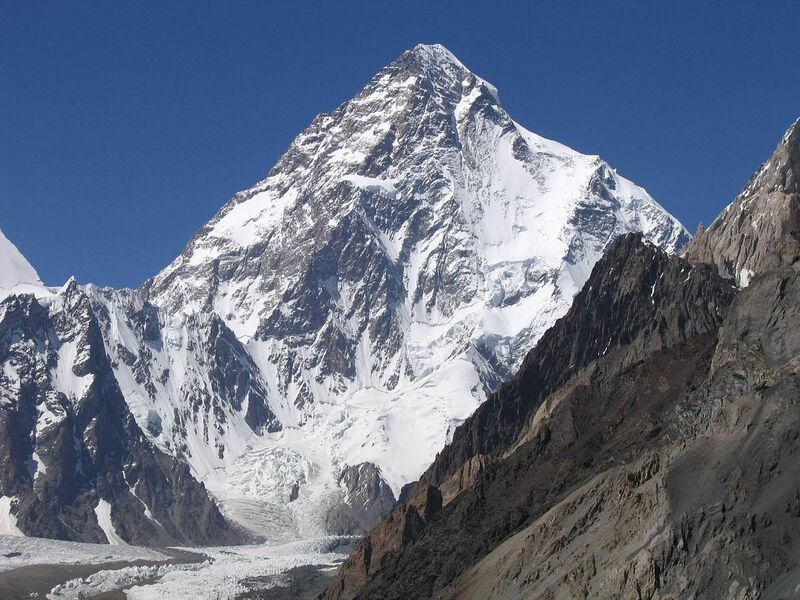 Other major expedition teams that will be on K2 this year include Seven Summits Treks, SummitClimb, and Himex, although Russell Brice has still yet to confirm his company’s participation this season. Last year was a particularly frustrating one for him and his squad, promoting Brice to head home early, only to have other teams reach the summit. At the time, he had expressed his frustrations in an open letter that seemed to indicate he was ready to retire, but later clarified that stance and said he would continue guiding, admitting he still had to figure out what K2 was all about. In addition to the well established commercial squads, there are a number of talented individual climbers in the region this summer with their own objectives too. For instance Romanian Alex Gavan and Turkish alpinist Tunc Findik have set their sites on Nanga Parbat this summer, while Adam Bielecki and Jacek Czech are heading to the Gasherbrum massif, possibly to bag several summits. 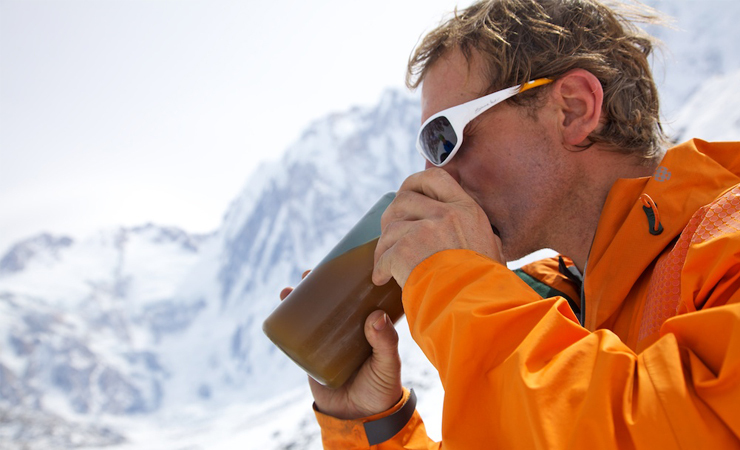 Polish climber Andrzej Bargiel is back once again this summer as well to continue his pursuit of climbing and skiing down K2, something that seems utterly wild. Fredrik Sträng will have a go at K2 as well and indicates that he’ll be setting out for Pakistan in the middle of next week, while Nathalie Fortin and Brit Jake Meyer have also targeted the world’s second highest peak. For now, most of these teams and climbers are still in the preparation phase back home, but there are a few who have already reached their starting points. For instance, Mike Horn has already started acclimatizing on Nanga Parbat and went to Camp 2 yesterday. His most recent dispatch indicated that he is planning on moving higher today, which would lend me to believe that he is looking at a rapid ascent on this mountain. At this rate, he could be done and heading home before most of the other teams arrive. We’ll just have to wait to see what happens. That’s all for now. The stage has been set and soon the Karakoram will start to get busy. We’ll be following the news there very closely for the next month and a half. Himalaya 2017: Everest Summiteer Cory Richards Shares Intimate Challenges of His Life. In the mountaineer world Cory Richards is known as quite a success story. He is an accomplished climber and adventure photographer who has topped out on some of the world’s tallest peaks, including Everest. Back in 2011, he was even part of the first team to complete a winter ascent of Gasherbrum II, joining Simone Moro and Denis Urubko on the summit. To all outside appearances, Richards looked like a guy who had the world at his feet, knocking off tall peaks in remote parts of the world and delivering some of the most stunning images of those places. But, as it turns out, he was also battling a lot of demons, which hid just below the surface threatening to bring it all crashing down. In a new article for National Geographic, Richards opens up about the challenges he has faced in his personal life, revealing that he first ran into trouble as a young teenager who began using drugs and found himself homeless on the street at the age of 13. That would alienate him from his family for a time and send him on a downward spiral that would leave a lasting impression on any young person. But, he would eventually crawl out of that situation and reunite with his family. Years later, while climbing Gasherbrum II, he would get caught in an avalanche, narrowly avoiding death. Understandably that would lead to Richards developing a case of PTSD that would begin to haunt him on and off the mountain. He started to drink, he battled addiction issues, he got married but struggled to stay faithful. The difficulties continued to mount, even as his career really started to take off. Eventually, it would all come crashing down. He lost his wife, he left the multimedia studio he helped found, he turned away from friends, and it looked like everything would implode. Then, last year, climber Adrian Ballinger reached out to Richards to see if he would be interested in climbing Everest together. 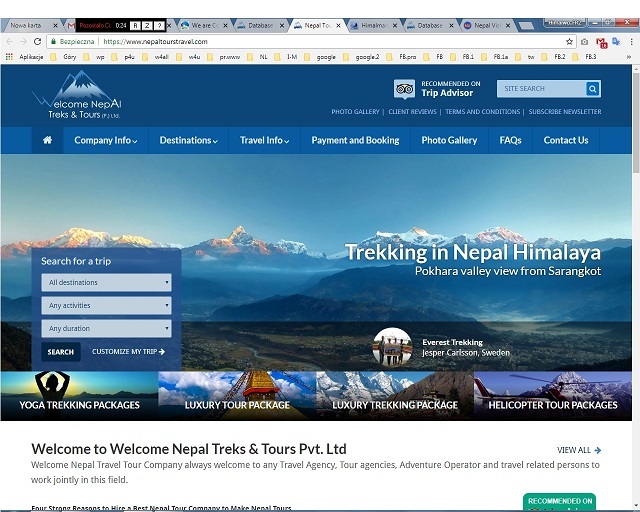 The two men traveled to Nepal and went to work on the highest mountain on the planet, using social media in unique ways to document their climb. On summit day, Ballinger was forced to turn back, but Richards continued upward, reaching the summit alone. It was then that he knew he had to confront the demons that he faced and get his life together. In the article, Cory shares some very personal stories about his internal battles, how he got to the lowest point in his life, and what it has been like to crawl back out of that spot again. He gives us a stark, honest look at himself with the hopes that his story might help others, even as sharing the truth helps him too. It is an interest read and a cautionary tale for sure. Check it on in its entirety here. ** see also: –Himalaya Spring 2017: Season Progressing On Schedule. Winter expedition to Nanga Parbat 2011/2012: Pakistan wrap-up – details on Nanga Parbat new route attempt. 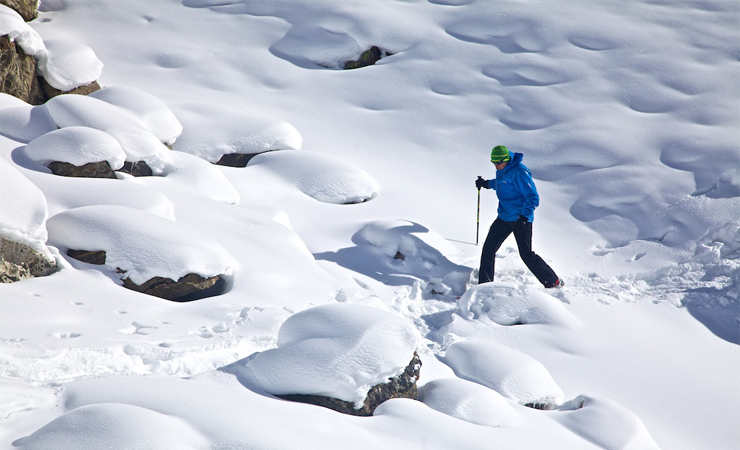 Simone Moro takes us into the world of winter mountaneering. After his first winter ascents of Gasherbrum II he introduces us to his next project: to climb Nanga Parbat with Denis Urubko. Today was supposed to be the last day of rest and tomorrow the planned departure for Denis and Simone to begin the planned one week stretch of climb to attempt the summit. But as it is ultimately important to have the right weather conditions, the team must now wait a few more days as the forecast for the next days is not favourable. Karl Gabl is always right! The weather today began with sun so we started to train a bit. A 4 hours walk down to Kutgully using snow shoes and setting up a route for the shepas who will come tomorrow bringing food and fuel to sustain us for the next month. We walked pretty well and set a really good path through the valley. On the way back from Kutgully the sky became cloudy but we expect some light snow fall tomorrow as forecasted by our weather guru in Innsbuck. 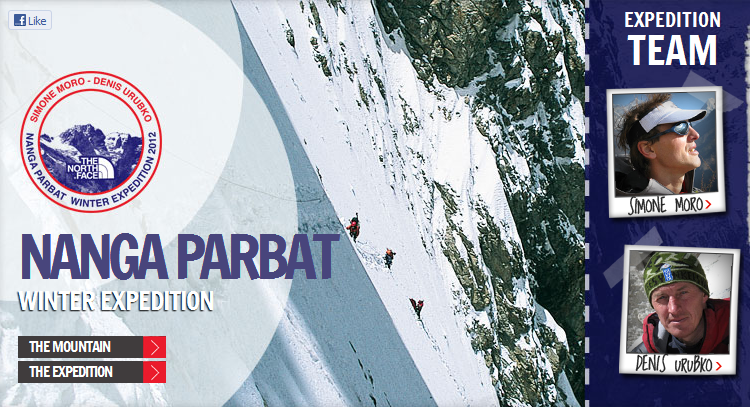 – Winter expedition to Nanga Parbat 2011/2012: Moro and Urubko expedition Video Dispatch. 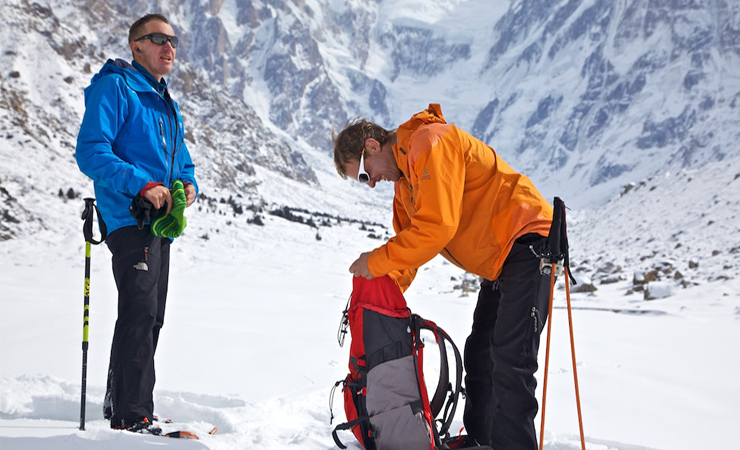 – Winter expedition to Nanga Parbat 2011/2012: Simone and Urubko Acclimatize at Camp 3 – 6600m. 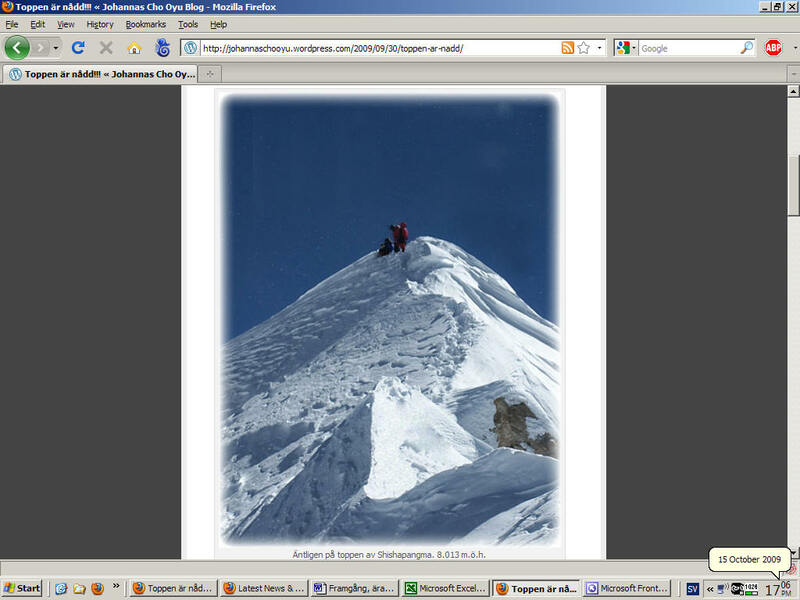 – Winter expedition to Nanga Parbat 2011/2012: Moro and Urubko Reach Basecamp 4230mt. Polish winter expedition to Gasherbrum I 2011/2012, part4. Zimowa wyprawa PZA na Gasherbrum I 2011/12. Polish winter expedition to Gasherbrum I 2011/2012, part4. Winter expedition starts! 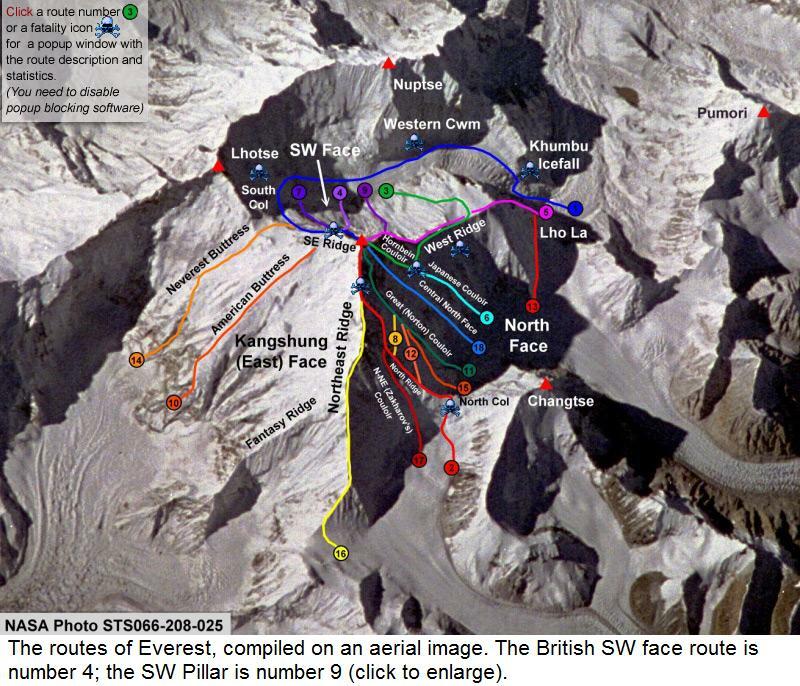 The expedition is going to operate from December 2011 to March 2012 and climb via classic route leads from the west side and in the upper parts goes through the so-called “Japanese Couloir”, situated in the highest part of the north-west face. 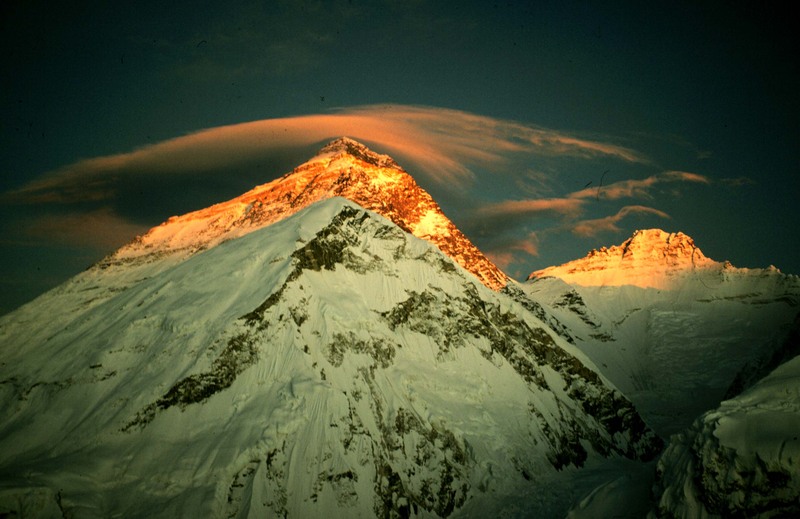 This route is the aim of the expedition, whose main task is to ascend in winter for the first time in history the eleventh highest mountain in the world. the team : Adam Bielecki, Agnieszka Bielecka, Janusz Gołąb. Adam Bielecki after spending a night in camp 1. Yesterday at 4:30 PM local time, Adam Bielecki together with two high altitude porters, Ali and Shaheen, established camp 1 at 5,930 m above sea level. Today at 6 AM local time Artur and Janusz have set off to transport a part of deposit to camp 1 and tomorrow they are going to make a reconnaissance of a route towards camp 2. Today Adam, Shaheen and Ali have descended to the base camp at approximately 2 PM. We set off at 6:40 AM and already at 9:30 AM, after a fast march, we reached the place, where we left our deposit two days ago. It turned out that the deposit place was only 30 minutes away from the so-called lower plateau, through which our route led. The route was not very difficult despite the cracks covered with snow. However, the next glacial barrier turned out to be difficult in terms of finding one’s way and very dangerous – each of us fell into a crack at least ones and Ali even experienced a 4-meter fall into one of them. A route through numerous brittle snow bridges and ice walls led us to the upper plateau. Its terrain seemed technically easy – almost flat snow surface, however, it turned out that the plateau was transected with very wide, parallel cracks that forced us to weave our way and follow our footsteps back in order to walk around the cracks. It was impossible to walk around one of them, thus we had to walk down to its bottom (approx. 40 m) and search for an exit on the other side. We managed to find it after approx. 300 m of walking on the bottom of the crack! Weather conditions were gradually worsening during the day, what basically meant increasingly stronger wind. Camp 1 was reached at approx. 4:30 PM; we put up a tent while copying with a very strong wind. In practice it meant a constant fight with possible frostbites; after every single activity we had to warm up our fingers. At approx. 6:00 PM we could rest in our sleeping bags; we were too exhausted to eat. Although today in the morning our footsteps have been partly covered with snow, GPS has helped us to find our way back without problems. At approx. 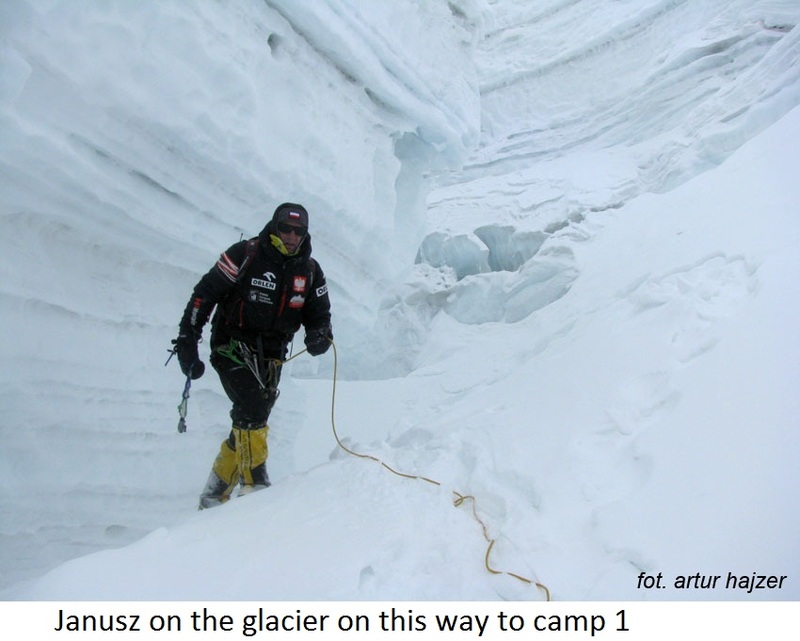 11:00 AM, halfway through the lower plateau, we have met Janusz and Artur, given them the GPS with the marked route to camp 1, wished them luck and after three hours reached the base camp; on our way we have also rigged the ropes next to two especially nasty cracks. At the time of writing this report (4:40 PM), Artur and Janusz are approx. one hour away from camp 1. In one of our first reports we described the icefall: how it changed, how difficult it was and that we covered 70% of the road at this stage. However, we were wrong. As it turned out, we covered only 30% of it and the rest was equally difficult. The difficulty did not lie with rubble or seracs; the main problem was to find a way through the gigantic crevasses. The team consisting in Bielecki, Sadpara and Baig that on 26th January established camp 1 showed great strength and determination. On 27th January Janusz Gołąb and me (Artur Hajzer) followed them. We set off, according to the rules, at 6 AM. Adam informed us via radio that the route leading to camp 1 had been long and exhausting and that probably we would fail to make it to camp 1, but if we planned to do so, we had to take with us a light assault tent and be prepared for a bivouac. We felt insulted. We would not make it? By following a route? By following their footsteps? What was going on? Was Adam pulling my leg? We met Adam’s descending team between the icefalls at approx. 11:30 AM. Adam went on talking: “Guys it’s far away! It may happen that you won’t manage to get there. I’ll give you my GPS.” And he gave it to us. We took it with a slight idea about how to use it and continued walking. We were ascending while Adam, Ali and Shaheen were descending. We walked … and walked … and walked … and walked between the blocks of seracs, in ice canyons and between various crevasses. Unfortunately, on the hard patches of the upper plateau weak traces of crampons of Adam’s team were invisible. We could not follow their traces. There were also no tracers, because at this stage Adam’s team had already used all of them and they did not have a possibility to mark the entire route. The hike was getting complicated. The route was meandering often into the opposite direction than the presumed camp. All in all, we have camp 1 – so much exhaustion, fear and work and it is only the first camp. 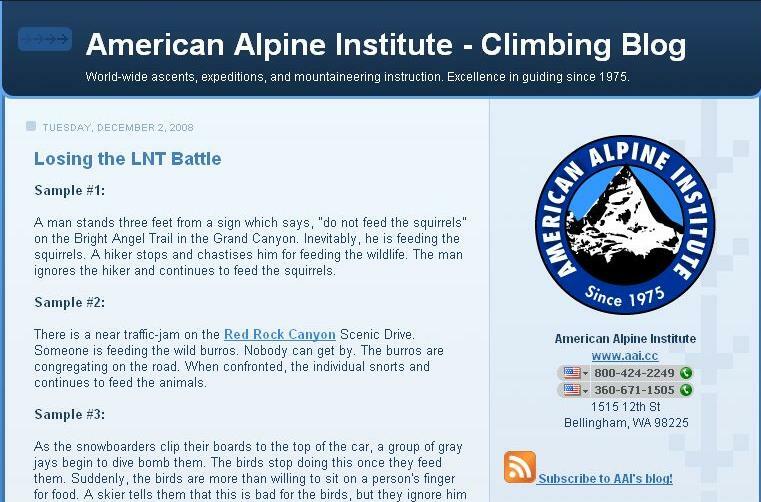 What is going to happen at higher altitudes?! For the main fight is to take place above 7,000 m. During our stay in camp 1 we could have a look at a pass leading to camp 2. There is also an open glacier. Hmm … what will happen? Good weather for the summit attempt. 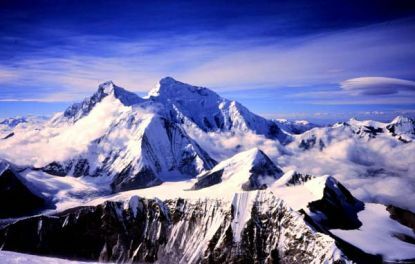 Tomorrow Adam Bielecki, Ali and Shaheen are going to leave the base camp in order to try to establish camp 2. Hajzer-Gołąb team is going to act according to their progress. The weather during these days is good the second year in the row. Jet stream moved over the south Pakistan. At 8,000 m above sea level the wind blows with 50 km/h. 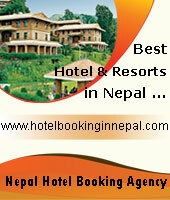 On 1st February the weather is supposed to be exceptionally good – sunny and without wind. We would not be surprised if other teams attempted the summit and succeeded. However, we would like to remind you that our strategy included attempts at the end of February and the beginning of March. Winter tactics is a roulette, but we believe in our assumptions. – Polish winter expedition to Gasherbrum I 2011/2012, part3. Zimowa wyprawa PZA na Gasherbrum I 2011/12. – Polish winter expedition to Gasherbrum I 2011/2012, part2. Zimowa wyprawa PZA na Gasherbrum I 2011/12. – Polish winter expedition to Gasherbrum I 2011/2012, part1. Zimowa wyprawa PZA na Gasherbrum I 2011/12. – Polish winter expedition to Gasherbrum I 2011/2012. Zimowa wyprawa PZA na Gasherbrum I 2011/12. Zimowa wyprawa PZA na Gasherbrum I 2011/12 – cz.4. Zachmurzenie 100% pułap chmur 6200 m n.p.m. Wczoraj o 16:30 czasu lokalnego Adam Bielecki wraz z dwoma tragarzami wysokogórskimi Alim i Shaheenem założyli obóz pierwszy na wysokości 5930 m n.p.m. Dzisiaj o 6 rano czasu lokalnego Artur i Janusz wyszli przenieść część depozytu do obozu pierwszego i jutro zrobić rozpoznanie drogi w kierunku obozu drugiego. Adam, Shaheen i Ali zeszli dzisiaj około 14:00 do bazy. Wyruszyliśmy o 6:40 rano i już o 9:30 po bardzo szybkim marszu osiągnęliśmy miejsce złożonego dwa dni wcześniej depozytu. Miejsce depozytu okazało się być położone zaledwie pół godziny drogi od tak zwanego dolnego plateau, którym wiodła dalsza droga. Droga ta była niezbyt trudna, pomimo przysypanych śniegiem szczelin. Dopiero następna bariera lodowcowa okazała się trudna orientacyjnie i bardzo niebezpieczna – każdy z nas przynajmniej raz wpadł do szczeliny, a Ali zaliczył czterometrowy lot w głąb jednej z nich. Niezliczona ilość kruchych mostów śnieżnych, oraz ścianek lodowych doprowadziła nas do górnego plateau. Jego teren wydawał się łatwy technicznie – praktycznie płaska, śnieżna powierzchnia, jednakże jak się okazało była ona poprzecinana bardzo szerokimi, równoległymi szczelinami, co zmuszało nas do niekończącego kluczenia i wracania po własnych śladach celem obejścia tych szczelin. Jedna z nich okazała się nie do ominięcia, co zmusiło nas do zejścia na jej dno (około 40 m) i szukania wyjścia po drugiej stronie. Udało się to po około 300 metrach marszu dnem szczeliny! Warunki pogodowe w ciągu dnia sukcesywnie się pogarszały, co oznaczało przede wszystkim coraz silniejszy wiatr. Obóz I osiągnęliśmy około godziny 16:30, namiot rozbijaliśmy przy bardzo silnym wietrze. W praktyce oznacza to nieustającą walkę z ryzykiem odmrożeń, po każdej najdrobniejszej czynności musieliśmy zadbać o rozgrzanie palców. Koło 18:00 bardzo zmęczeni mogliśmy odpocząć opatuleni śpiworami, na jedzenie byliśmy zbyt zmęczeni. Dzisiaj rano pomimo tego, że zasypało część naszych śladów, GPS pomógł nam sprawnie odnaleźć drogę powrotną. Około godziny 11:00 spotkaliśmy w połowie dolnego plateau, podchodzących do góry Janusza i Artura, przekazaliśmy im GPS z zapisem drogi do obozu I, życzyliśmy powodzenia i po trzech godzinach dotarliśmy do bazy, po drodze poręczując jeszcze dwie szczególnie nieprzyjemne szczeliny. W momencie pisania relacji (16:40) Artur i Janusz znajdują się około godziny drogi od obozu pierwszego. Około 18.30 czasu lokalnego Artur j Janusz szczęśliwie dotarli do jedynki. Spędzą tam noc, i jutro – o ile pogoda pozwoli – będą chcieli wyjść wyżej na rekonesans w kierunku planowanego obozu drugiego. W jednej z pierwszych relacji, opisywaliśmy icefall: jak bardzo się zmienił, jak bardzo jest trudny i że pokonaliśmy około 70% drogi na tym etapie. Myliliśmy się, jak się okazało pokonaliśmy wtedy zaledwie 30% a w dalszej części drogi trudności nie spadały. Jednakże trudnością nie było rumowisko, zwaliska seraków, głównie trudności skupiały się na wyszukaniu drogi pomiędzy monumentalnych rozmiarów szczelinami. Dużą siłą i determinacją wykazał się zespół Bielecki, Sadpara, Baig, który 26.01 założył obóz pierwszy. 27.01. Janusz Gołąb i ja (Artur Hajzer)ruszyliśmy za nimi. Wystartowaliśmy przepisowo o godzinie 6 rano. Adam zakomunikował nam przez radio, że droga do obozu pierwszego jest tak długa i wyczerpująca, że raczej nie dojdziemy, a jeśli mamy taki plan to na wszelki wypadek powinniśmy zabrać ze sobą, lekki namiot szturmowy i liczyć się z biwakiem. Odebraliśmy tę sugestię jako afront. Jak to my mamy nie dojść? I to po wytyczonej już trasie? Po ich śladach? O co chodzi? Adam kpi czy o drogę pyta? Schodzący zespół Adama spotkaliśmy pomiędzy lodospadami około 11:30. Adam znowu swoje: „Chłopaki jest daleko! Może się zdarzyć, że nie dojdziecie. Dam wam GPS.” I dał. Wzięliśmy ten GPS bez większego pojęcia jak go używać i ruszyliśmy dalej. My w górę, a Adam , Ali i Shaheen w dół. I szliśmy… szliśmy… szliśmy i…. szliśmy, pomiędzy blokami seraków, w lodowych kanionach, pomiędzy różnej szerokości szczelinami. Niestety na twardych połaciach górnego plateau wątłe ślady po zębach raków Adama i ekipy przestały być widoczne. Nie mogliśmy liczyć na ślady poprzedników. Nie było też traserów bo na tym etapie zespołowi Adama, już ich zabrakło, i nie mieli możliwości oznaczenia całej drogi. Dalsza wędrówka komplikowała się. Droga prowadziła kilkusetmetrowymi zakosami, często w przeciwnym kierunku niż domniemany obóz. Około godziny 16:00 zrobiło się poważnie Dotarło do nas, że dzień się kończy a obozu ani widu ani słychu. Nie mieliśmy też pewności czy jesteśmy na szlaku. Został nam tylko ten GPS i konieczność zdecydowanie przyspieszonego kroku. A w GPSie tylko cienka zielona kreska (zaznaczona przez Adama trasa) i biały trójkącik (my). Jakoś się ten obrazek kręci wokół ale dopóki trójkącik jest na zielonej linii to czujemy się bezpiecznie. Godzina 17:00 zmierzcha GPS wskazuje, że do obozu nie jest już daleko. Zaczynamy biec nie bacząc na szczeliny, które mniej lub bardziej skutecznie przeskakujemy. Raz mój tułów wpada w czeluść ale Janusz skutecznie blokuje mnie liną wychodzę i zasuwamy dalej. Robi się ciemno. Wpatrujemy się w GPS. Adam instruuje nas przez radio jak zrobić zbliżenie i generalnie jak posłużyć się GPSem by wskazał kierunek na obóz w linii prostej. Robimy zbliżenie. Obóz znajduje się według wskazań GPSa w promieniu 200m. Nie potrafimy jednak przestawić GPSa żeby wskazał drogę do obozu w linii prostej. Kręcimy się w kółko, nie trzeba dodawać, że bezskutecznie. 18:30 kompletna ciemność. Ślęczymy nad GPSem. Przestajemy się ruszać, mokre primalofty tracą właściwości grzewcze, dopadają nas dreszcze, GPSa obsługujemy końcówką czekana lub gołymi palcami. Jedna minuta Janusz, jedna minuta ja. Adam z bazy mówi nam, żeby wejść do menu i w funkcję „znajdź”. GPS zamglony, nie mogę odczytać małych literek na ekranie. GPS przejmuje Janusz w funkcję „znajdź” nie udaje się wejść. Jest coraz zimniej, rozgrzewam palce. Janusz uważa, że damy radę wykopać jamę śnieżną. Mamy gaz i jakieś żarcie. Zbliżam trasę Adama na GPS, który wskazuję, że obóz powinien się znajdować 48 metry od nas. Idę powolnym krokiem za wskazaniami GPS’a, Janusz za mną. Słyszę Janusza: „Jest, widzę, po prawej!” znaleźliśmy obóz. Jest 19:20. Mamy obóz – melduję do bazy. W bazie – gdzie od ostatnich dwóch godzin też było dość nerwowo – ciśnienie opada. Rozbijamy namiot i wszystko jest w porządku. Rano schodzimy do bazy niemal cały dzień. W tym terenie jest to bez znaczenia czy się idzie w górę czy w dół, tempo niewiele się różni. W każdą stronę jest trudno i daleko. Sytuacja różni się bardzo od tej samej drogi w lecie. W zimie lodowiec jest bardziej „otwarty” – prezentuje. Koniec końców mamy obóz I, tyle wysiłku, strachu i pracy a to dopiero obóz pierwszy. Co będzie wyżej?! Wszystko ma się przecież rozegrać powyżej 7000. Będąc w „jedynce” przyjrzeć się mogliśmy drodze na przełęcz do obozu II. Tam też otwarty lodowiec. Hmmm… Co to będzie? Co to będzie? Dobra pogoda na atak szczytowy. Jutro wychodzi z bazy Adam Bielecki z Alim i Shaheenem z planem założenia obozu II. Zespół Hajzer-Gołąb będzie reagował odpowiednio do ich postępów. Już drugi rok z rzędu panuje w tych dniach bardzo dobra pogoda. Jet Stream odsunął się nad południowy Pakistan. Wieje słabo – na 8000m n.p.m. do około 50 km/h. 1lutego ma być wyjątkowo dobra pogoda – „bezwietrzna” i słoneczna. Nie bylibyśmy zaskoczeni – gdyby inne wyprawy zaatakowały szczyt i jak rok temu odniosły sukces. Naszą wybraną strategią – przypominamy – są ataki na przełomie lutego i marca. Zimowa taktyka to jednak ruletka, mimo to wierzymy w nasze założenia. 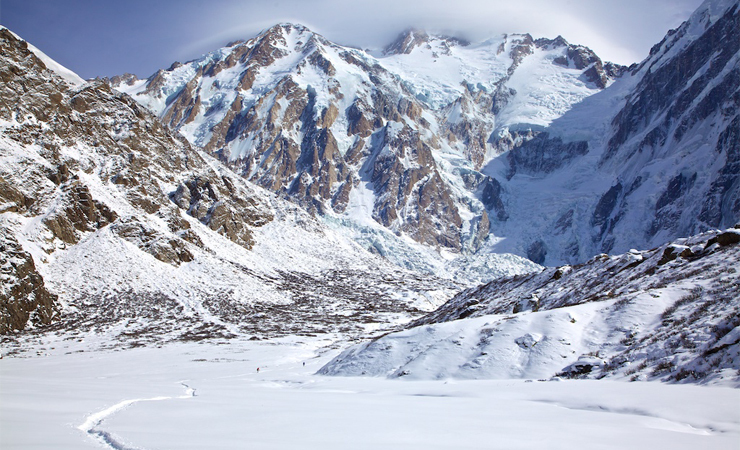 Winter expedition to Nanga Parbat 2011/2012: Moro and Urubko expedition Video Dispatch. Nanga Parbat Winter Expedtion Video Dispatch 4. The North Face Nanga Parbat Winter Expedition Video Dispatch 4; in this video you will watch the guys as they prepare for acclimatization going up to base camp 1 and coming back down after getting the news of the death of a very close friend who is also an alpinist in Italy. This news hit them really hard and they really needed to go back down to reorganize their thoughts. They also meet with their polish friends who are also trying to Summit Nanga Parbat this winter. Nanga Parbat Winter Expedtion Video Dispatch 3. The North Face Nanga Parbat Winter Expedition — In this video dispatch, we show The North Face Athletes; Simone Moro and Denis Urubko in life-at-Basecamp (4230m) as they acclimatize and attempt to get to camp1, Enjoy this and more to come soon. Nanga Parbat Winter Expedtion Video Dispatch 2. This winter, The North Face Athletes – Simone Moro and Denis Urubko continue on this epic adventure to attempt the summit of Nanga Parbat, the 9th highest mountain in the world. In this video dispatch we bring you the sights and sounds from the second phase of their travel until Basecamp. Nanga Parbat Winter Expedtion Video Dispatch 1. The North Face Nanga Parbat Winter Expedition – In this dispatch you will watch Simone Moro and Denis Urubko as they progress in the first phase of the journey from Italy – Islamabad – Chilas and to Basecamp 4230m. Enojoy this and more to come soon. 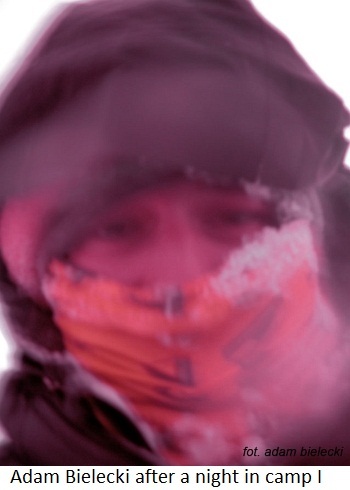 Polish winter expedition to Gasherbrum I 2011/2012, part3. Zimowa wyprawa PZA na Gasherbrum I 2011/12. 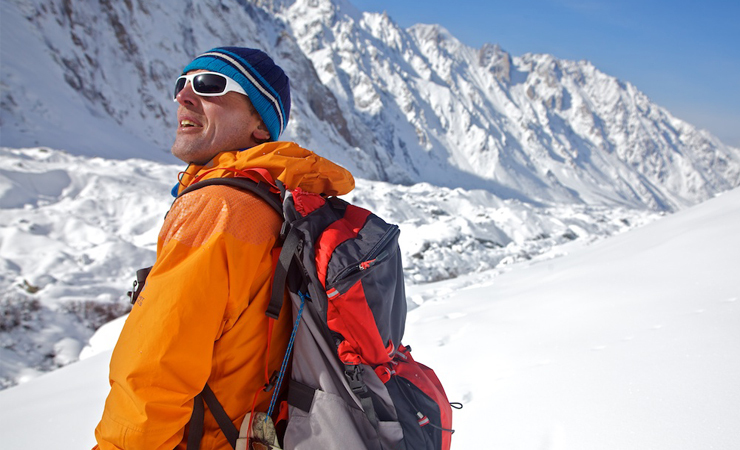 Polish winter expedition to Gasherbrum I 2011/2012, part3. 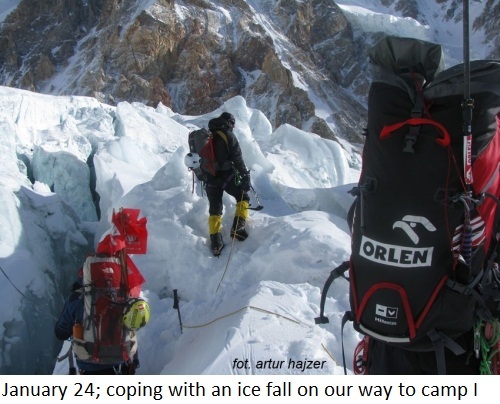 Watch a film – report from road to Askole , 15.01.2012 – Polish winter expedition to Gasherbrum I 2011_2012 . 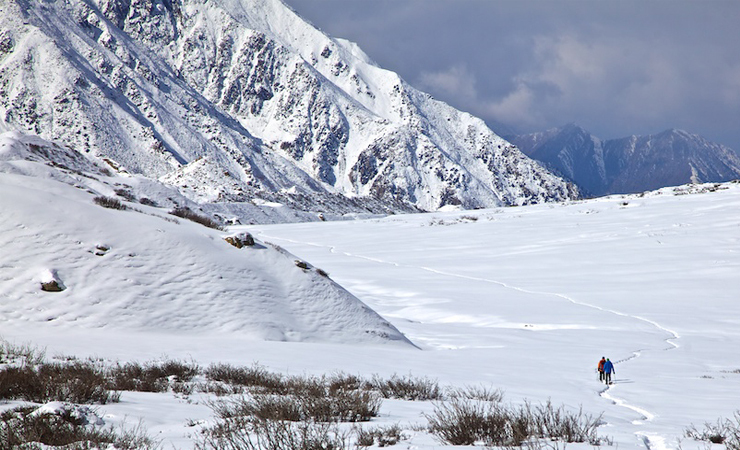 Watch a film showing our caravan on its way to the base camp at the foot of Gasherbrum. There are only old patches of snow and snowdrifts in the base camp. We have already been uphill. On 24th January we planned to establish camp I. The weather was perfect: sunny and freezing. All five of us set off with rather light backpacks, just in case. We did not plan to rig the ropes, however, we took 200 m of ropes expecting that a six-kilometer icefall in winter could cause some problems. We were right. 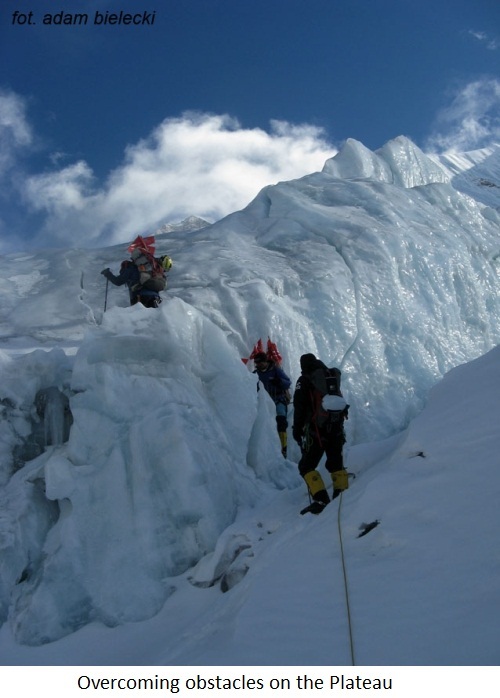 All that we had heard about the long and technically challenging icefall turned out to be true. There were screes, cracks, ice walls, sharp ridges and overhung seracs; the final part of plateau was completely covered – perhaps due to a small earthquake or other reasons. All things considered we weaved our way through this labyrinth, had our hearts in our mouth and failed to reach camp I at 5,900 m above sea level. We covered 70% of the route on the glacier, up to 5,700 m above sea level. Then, rubble on the plateau has stopped us, but we hope to overcome it within a couple of days. On our way back to the base camp we rigged the ropes on more difficult parts of the route with 150 m of rope. We also used 50 tracers to mark the route. During the first night, after we had come back to the base camp, we dreamt about cracks and brittle ice bridges on the icefall. To be frank, this part of the route in winter is an ultimate horror. One has to be constantly attached to a rope and be extra cautious. 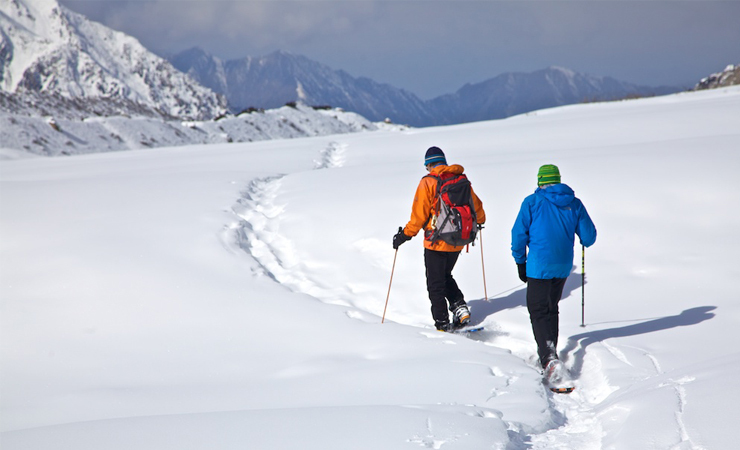 It is not going to be easy; if the snow falls and covers our traces, we will have to mark the route anew. We got a rap on the knuckles. 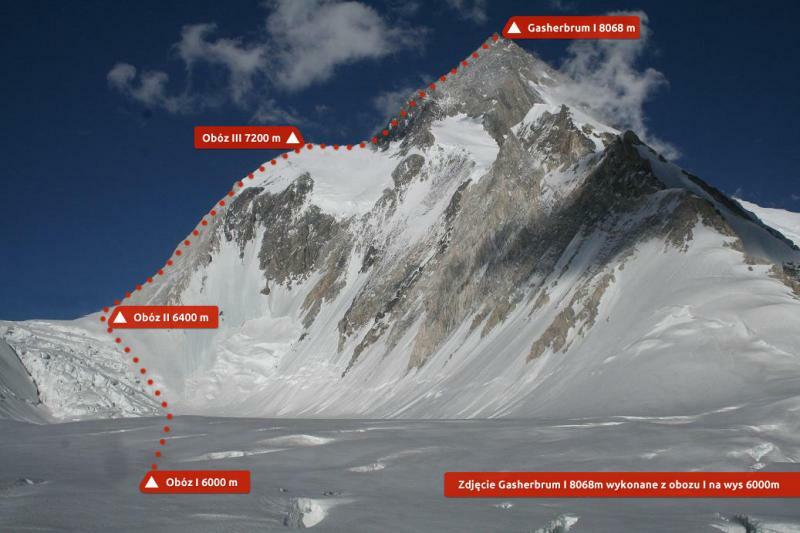 Zimowa wyprawa PZA na Gasherbrum I 2011/12 – cz.3. “Droga do Askole” – zobacz film pokazany powyżej, w części EN. Zapraszamy do obejrzenia filmu pokazującego jak wyglądała karawana do bazy pod Gasherbrumem – zobacz film pokazany powyżej, w części EN. W bazie tylko stare płaty śniegu i stare zaspy. Jesteśmy po pierwszym wyjściu w góry. 24 stycznia zamierzaliśmy założyć obóz I. Pogoda była idealna: Słonecznie i mroźnie. Wyszliśmy całą piątką, na wszelki wypadek z dosyć lekkimi plecakami. Nie planowaliśmy zakładać poręczówek, wzięliśmy jednak 200 m lin spodziewając się, że sześciokilometrowy ice fall w warunkach zimowych może stanowić nie lada problem. Tak też się stało. Wszystko co słyszeliśmy o tym długim i męczącym technicznie lodospadzie okazało się prawdą. Były zawaliska, szczeliny, lodowe ścianki, ostre granie i wiszące nad głową seraki, końcowe plateau uległo całkowitemu zawaleniu być może miało tu ostatnio miejsce małe trzęsienie ziemi, albo też po prostu zawaliło się samo z siebie. W związku z powyższym, kluczyliśmy na lodowcu jak w labiryncie z duszą na ramieniu i nie osiągnęliśmy obozu I na 5900 mnpm. Pokonaliśmy około 70 % drogi na lodowcu do wysokości ok. 5700 mnpm. Dalszą drogę uniemożliwiło nam gruzowisko zawalonego plateau, które mamy nadzieję pokonać w ciągu kilku dni. W drodze powrotnej do bazy, zaporęczowaliśmy trudniejsze odcinki, zużywając 150 m. liny. Zużyliśmy też 50 traserów, dla oznaczenia drogi. Pierwszej nocy po powrocie do bazy śniły nam się szczeliny i kruche lodowe mosty na ice fallu. Uczciwie mówiąc ten odcinek trasy w warunkach zimowych to istny horror. Trzeba być ciągle związanym i zachowywać dużą czujność. Na pewno nie będzie łatwo, jeśli spadnie śnieg i zasypie nasze ślady drogę wytyczać trzeba będzie na nowo. Trochę dostaliśmy po łapach.